Pachypodium namaquanum is known as the ‘half-mens’ (half-person) plant to Namibian locals. The plant grows in the Gariep Region which stretches along the Orange River border with South Africa. Here you will find these alien-like succulents towering up to 4m above the Martian landscape of the world’s only Arid Biodiversity hotspot. The plants are bottle-like in appearance with a thickset base tapering towards a lopsided apex. Knob-like projections on the stem of the tree carry a ‘fur’ of spines drooping downward beneath a crown of wavy leaves. Between July and September, a mop of yellow flowers with a pale maroon interior burst from the top of the plant, giving it the appearance of many an 80’s pop icon. Legend has it that when the war faring tribes of the north came to Namibia, the ancestors of the San bushmen fled south. As they reached the Orange River, some turned back for a last look at their homeland, and their spirits were forever frozen in time in the form of these plants. Another bottle-shaped succulent, Moringa Ovalifolia grows throughout Namibia. It is a smooth stemmed tree which proliferates on rocky hillsides all over the countryside, except in Etosha National Park, where the stems are gnarled and misshapen, unlike any other of their kind. Visit this Fairy-Tale Forest to see the only place on earth where these trees grow together en masse. These huge trees are an icon of the African continent and have been standing tall over the savannah for 200 million years. Known as the tree of life, the baobab’s flowers feed off reservoirs of water in its trunk, which remain filled with a nutrient rich sap when everything else in the surroundings has shriveled with aridity. Not only has this species been around forever, individual trees can live for up to 5 000 years. These behemoths are so large that animals and people can shelter in their hollowed out trunks, and there is even a pub carved out of one in the Northern reaches of South Africa. For centuries, people have been using every part of this tree for food, shelter, rope, clothing and oils. Nowadays, modern society has cottoned-on to the health benefits of the nutrient-rich fruit. In this way, the humble baobab continues to provide a livelihood for the poor communities who live among them. Leafless for most of the year, the baobab is sometimes described as the upside-down tree. Local legend tells how God, angered by the tree’s boastful vanity, uprooted it and thrust it upside down into the ground. The San Bushmen of Namibia use the tubular branches of the Quiver tree to craft arrows, hence the name. These ingenious folk have also figured out how to hollow out dead stumps of this tree to use as a refrigerator. The fibrous tissue of the trunk creates a cooling draft within, which is handy for preserving meat, vegetables and water. This same soft fibre is what stores water in living trees. In times of severe drought, the Quiver tree can seal off its extremities to prevent moisture loss through the leaves. These disconnected branches drop off and the tree rejuvenates itself again in times of plenty. Further drought-adaptations are a layer of light powder which covers the branches, helping to reflect the sun’s rays and keep the plant cool. 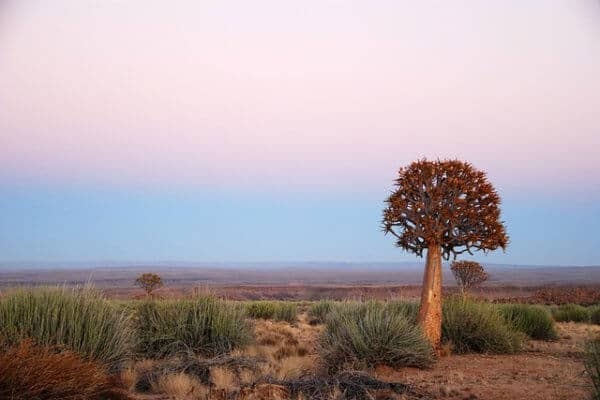 Quiver trees can survive extremely arid conditions, living for over 80 years, and reaching heights of 7m. Namibia is alive with many amazing survival stories of life in the harsh landscapes of one of Africa’s lowest rainfall areas. These amazing trees add to the wonder of the things you can see in Namibia. Try to include as many of them as you can in your visit to the Land of Sand.